Forex Trend Eater v2.0 is a concentrated, straight-to-the-point and easy-to-follow quick start Forex trading system that is jam-packed with the exact blueprints to everything you need to know about keeping your Forex trading without any time-wasting fluff! "Trend Eater v2.0" is a concentrated, straight-to-the-point and easy-to-follow quick start Forex trading system that is jam-packed with the exact blueprints to everything you need to know about keeping your Forex trading without any time-wasting fluff! * Spotting a strong trend that will happen soon - with my trading system, you can instantly jump on a strong market movement with great promising result. * Predict the support & resistance - A strong support & resistance (that my system tells) will guarantee an optimum gain for each trades. * What you need to know after execute a trade - I will tell you what to do after take an order. A Stop Loss dicipline and a good Take Profit level target are served by my system. 1. 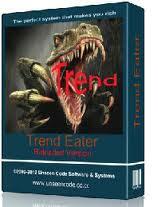 Trend Eater will analyze the major trend first, based on the main indicator. 2. When a signal is occured, then the system will test it wether it is good to take the order or not. 3. If the order is taken, then the System will automatically set the SL & TP levels. So simple, so easy...no hardwork anymore...no waste and no thinking. Let the Sytem does for you. And see the money comes to your pocket.